Gender reveal parties have become more and more popular. They are an exciting way to share the big news of your baby’s gender with family and close friends. 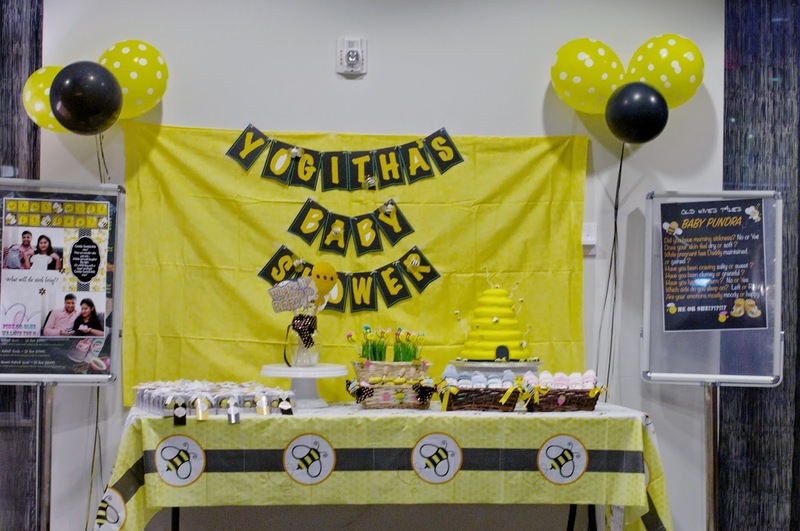 We attended an adorable “What Will It Bee” themed baby shower for our cousin, Nitesh, and his wife, Yogitha. We thought the party was so cute and we wanted to share it with you. 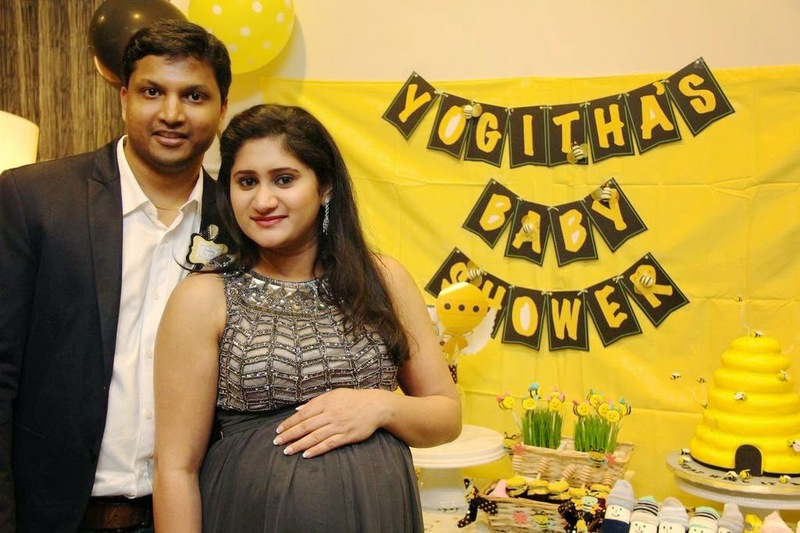 The hosts rented a beautiful space and transformed it into a bee hive by incorporating yellow, black and white decor. Party City created the bumblebee balloon boutiques. Napkins, plates and utensils were accordingly yellow and black. 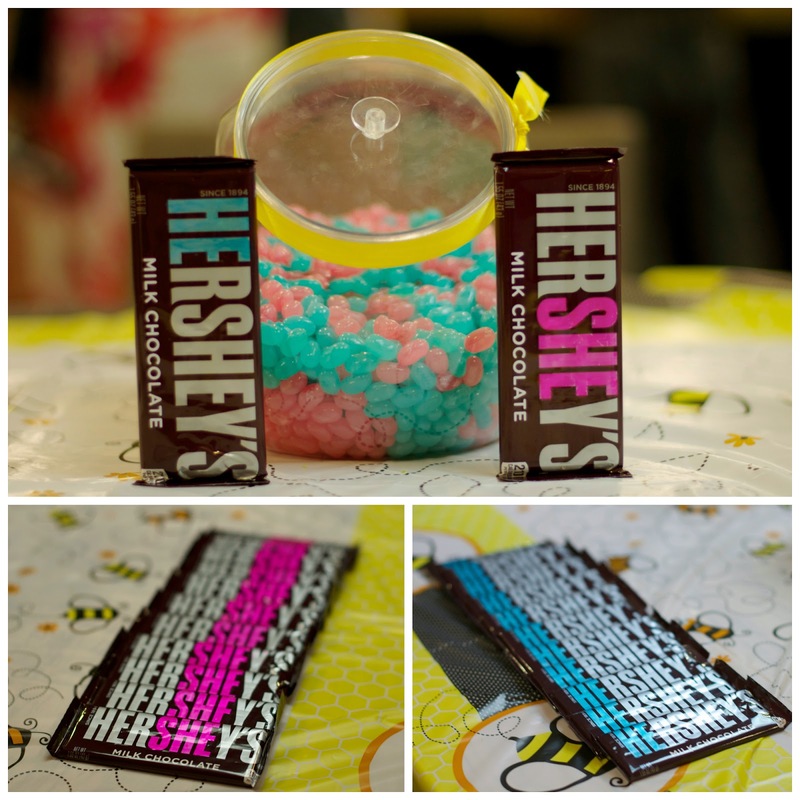 The welcome table was decorated with a whimsical bee hive tablecloth, a jar of blue and pink jellybeans (with a slightly more of the baby’s gender) and adorable HERSHEY’S and HERSHEY’S candy bars. The food was catered by Kati n More and featured delicious Indian specialties. The apps included: samosas, chicken 65, lamb chops, fish and fried cauliflower. The mains included: naan, mutton biryani, rice, chicken tikka masala, aloo gobi, paneer and raita. The bar was stocked with red and white wine and beer. 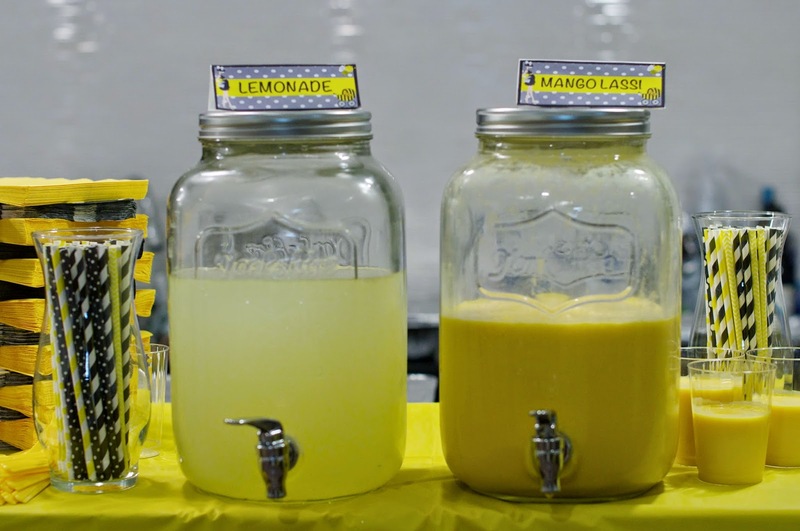 The specialty bee drinks were Mango Lassi and Lemonade. Guests sipped on these delicious beverages with their adorable bumblebee striped straws. A well-styled dessert bar can serve as the main attraction for your party. The hosts created their beautiful dessert display with a few simple items: balloons, banners, tablecloths, favors and scrumptious treats. 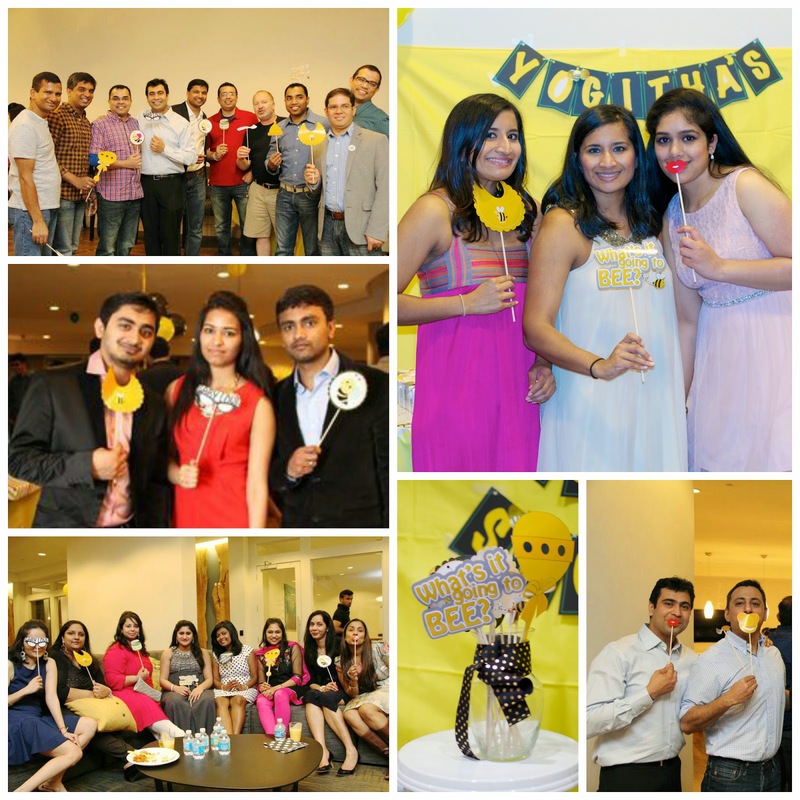 They constructed a whimsical banner from black chalkboard paper, yellow letters and organza bees. We loved the adorable marshmallow bees, which were created with Wilton’s yellow icing spray, black sugar strips and candy melts for the wings. 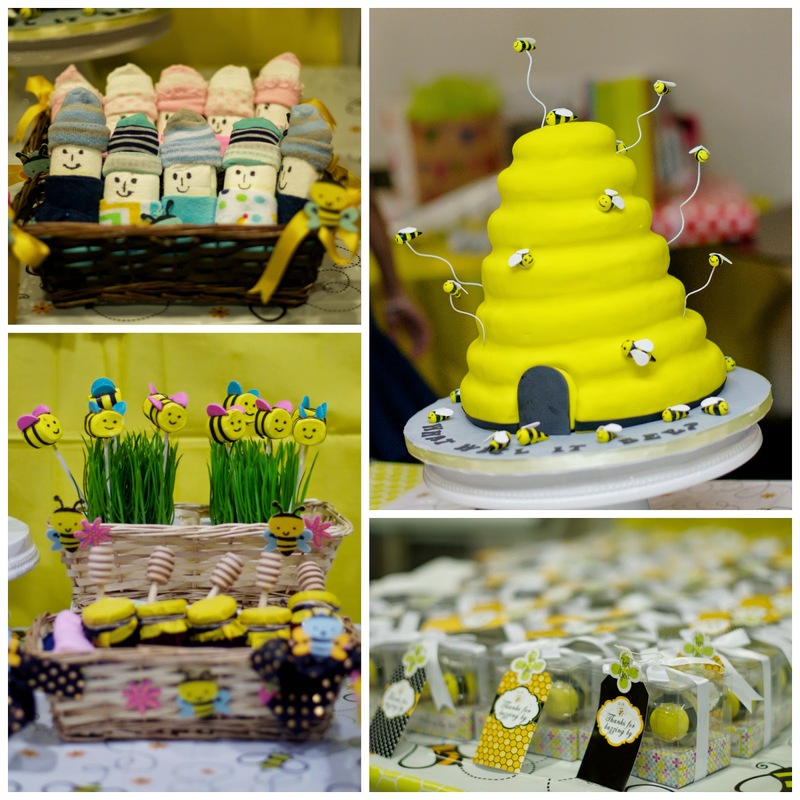 The hosts even added small jars of honey below the marshmallow bees. Instead of the traditional diaper cake, the hosts added diaper babies on the dessert table. They used socks as caps and washcloths as swaddle blankets. They were really cute! 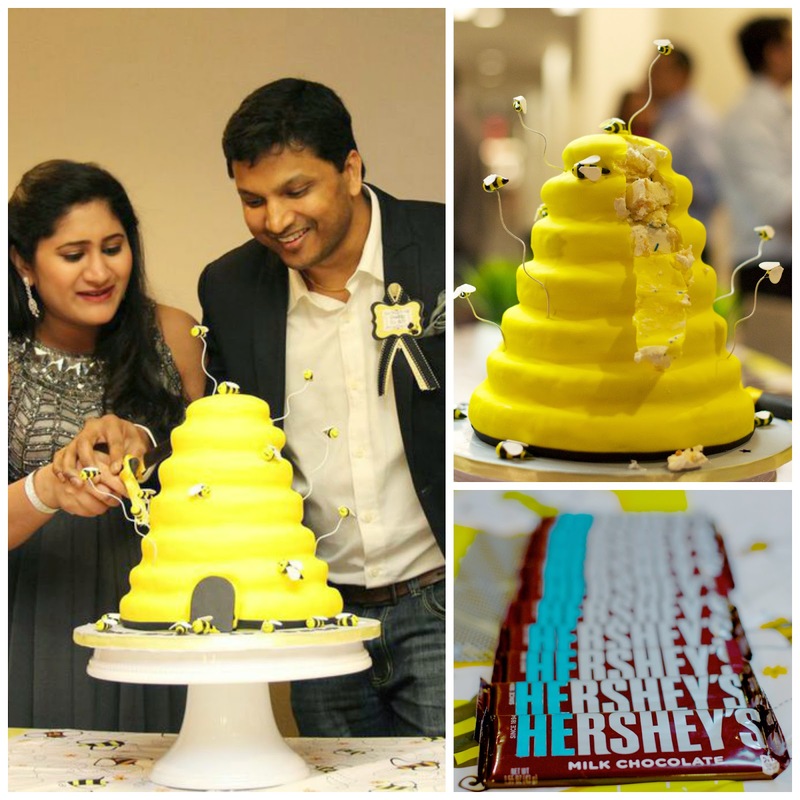 The star of the dessert table was CakeSuite’s three-tier bee hive cake with fondant bees. Trust us, it was stunning AND delicious: a moist vanilla cake with vanilla buttercream with sprinkles in the color of the baby’s gender. The Parents-To-Bee cut into the cake and found blue sprinkles inside. No party is complete without photo booth props. They make the party pictures so much more memorable, don’t they? The hosts found these adorable bee themed props at Michaels. 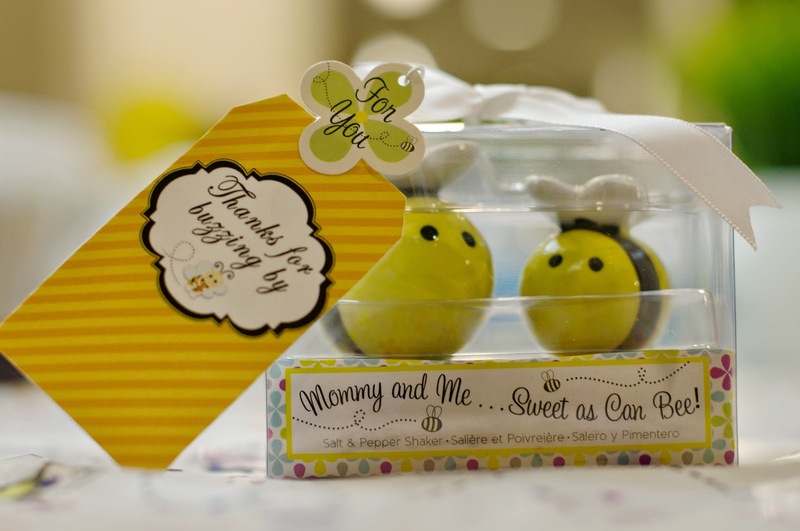 Guests departed with KateAspen’s adorable bee shaped salt & pepper shakers. We had so much fun at our first gender reveal party. The soiree was definitely more fun than the typical phone call with the news of the gender. Thanks for buzzing by! Marshmallow Bees: Marshmallows with Wilton’s yellow icing spray and black sugar strips, candy melts and black food writer (see links below).